Area rugs are both one of the most versatile and most misunderstood flooring options. Too often people relegate area rugs to a hallway or beneath a dining room table. They're missing some of the best applications for area rugs! With a little knowledge about size, shape and placement - you can use an area rug to update any room in your house. Area rugs come in so many sizes that it can be hard to know which one is best for your room. You don't want a rug so large that it looks like poorly measured carpet. But you also don't want a rug so small that it oddly floats in space. The right size for you is going to depend on the overall size of the room as well as the size of the area where you want the rug. If you have furniture in the room you have additional decisions to consider as far as how much of the furniture rests on the rug. Once you have a size in mind, you need to consider shape - rectangle rugs are great for hallways but if you want to define a sitting area, you might be better served by a square, circle or oval... or perhaps a custom-shape designed just for your space. A common issue for people looking for an area rug is that can't find one exactly the right size for their space. For the most part, area rugs are available in a set range of sizes. What can you do if those sizes aren't right for your room? Talk to Kermans. We can cut an area rug out of nearly any carpet style that will fit just right. Find a carpet style that you like - and with the hundreds of options we have in store, we're certain you'll find just the right color and design - and we'll create an area rug for you! Learn more about area rugs at Kermans. You can find area rugs in solid colors or simple gradients. Animal prints or traditional oriental designs. Repetitive geometric patterns or florals. Before you start shopping, consider the overall design of your room - you want a style of area rug that complements the room. You might also want to bring a throw pillow or fabric swatch with you to best match and complement the colors of the room. Whether you're looking to make a bold, trendy statement or want a simple rug that ties the room together, there's an area rug design that fits your needs. We saved the trickiest issue for last. 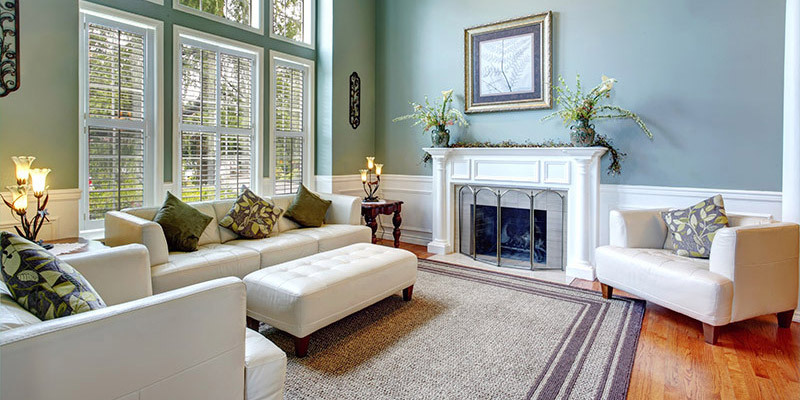 Just how do you place an area rug in your living room sitting area? Bedroom? Dining room? Each room has its own challenges - and each can be beautifully enhanced by the right area rug. Use our new area rug placement guide - complete with visual layouts - to help you see the best ways to place your area rug.